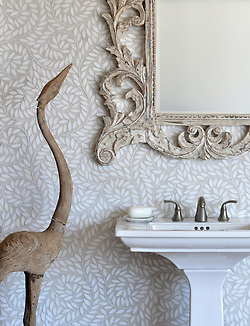 Damask was first woven in the city of Damascus in the early Middle Ages. Even when woven in monochromatic colors, the glossy warp threads create a reflection against the matte weft. Inspired by a damask fabric from Rogers & Goffigon, Sara created Kingston Lacy, a hand cut jewel glass mosaic shown in Absolute White and mirror. Jacqueline Vine was inspired by a wedding dress. Sara was determined to create the delicate patterns of lace using luminous Thassos marble from Greece. Each individual tessera (piece of mosaic in Italian) is cut using a waterjet saw, tumbled to create a soft pillow texture and assembled by hand for an intricate swirl of stone. Inspired by her travels along the Silk Road and her personal collection of Ikat textiles, Sara has integrated the classic patterns of Central Asian Ikat into vibrant mosaics. Loom, in Quartz, Aquamarine, Tanzanite, and Turquoise jewel glass is one of three Ikat patterns hand crafted at the New Ravenna studio in Virginia. Suzani is an embroidered tribal textile from Central Asia that was originally created as part of a bride’s dowery. Just like a mosaic, the festive needlework of Suzani fabrics require patience, skill and a commitment to traditions that have existed for centuries. The dramatic palette of Sara’s Suzani mosaic in Jasper, Carnelian, Agate, and Quartz jewel glass echoes a classic Uzbekistan pattern. Sara remembers, ” My McCaleb ancestors arrived from Scotland in the 1750’s. 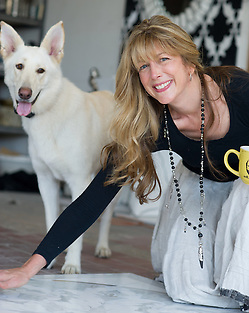 As a child I was immersed in family lore and creating clothes with traditional Scottish patterns fueled my imagination. 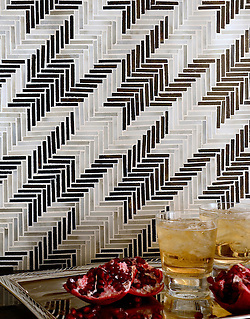 To create the same classic patterns in mosaic is a wonderful way to pay homage to my family and those fantastic early creative experiments in design.” McIntyre, shown in Thassos, Bardiglio, and Nero Marquina, is part of Sara’s Plaid and Gingham Collection. 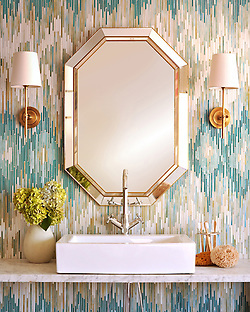 The top mosaic is from the fashionable Houndstooth Collection, available in four colorways of shimmering jewel glass. All of New Ravenna’s textile inspired mosaics are available in showrooms throughout the United States, Canada, Europe, Dubai, and Russia. New Ravenna Mosaics is America’s premier designer and manufacturer of stone and glass mosaic tiles for both residential and commercial installations. The company’s products are handcrafted mosaics, made in Virginia, that are fashioned into decorative borders, murals, fields, and medallions. 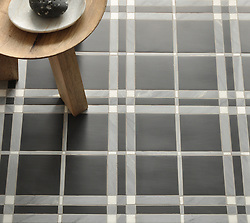 Tile is cut and can be tumbled, honed or treated to create distinctive styles, subtle shade variations and textures. The end products are custom works of art in mosaic tile, which often incorporate the designs of architects, interior designers and their clients. 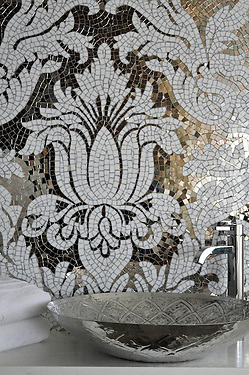 New Ravenna Mosaics sells exclusively through designer showrooms across the country and internationally. The company provides design services along with on-site supervision of installations. 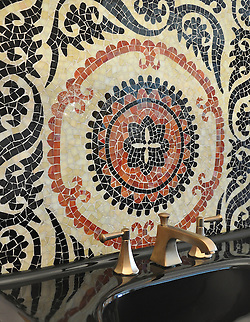 New Ravenna Mosaics products are found in homes, restaurants, hotels, casinos, and businesses around the world. Scroll down for a sampling of Textile inspired mosaics. See more hand made Textile inspired mosaics in our Textile Image Gallery, click here.